The Book Foundation's essential mission is to bring to light the universal message of Islam as revealed in the Holy Qur'an and the lived example of the Prophet Muhammad (peace and blessings upon him), as well as the finest elements of the Islamic tradition. The Book Foundation’s work is truly international in scope, with a sphere of operation embracing curriculum development, engagement in public discourse, creative arts sponsorship, and the publication of works which increase the public understanding of Islam. The Book Foundation also has the special purpose of disseminating the works of Muhammad Asad, notably The Message of the Qur’an, which is regarded by common consent as the best commentary on the Qur’an in the English language; The Message of the Qur’an has also been translated into Spanish and German, with other languages to imminently follow. The Book Foundation has offices both in the U.S. and in Europe. The editorial and publishing offices of the Book Foundation are in the United States, at 270 Quarter Horse Lane, Watsonville, CA 95076. The Book Foundation is also registered as a non-profit charitable company in the United Kingdom. The Book Foundation is a company limited by guarantee, registered in the UK and is governed by its Memorandum and Articles of Association and the Companies Act 1985. It was granted full charitable status by the UK Charity Commission in 2002. The Book Foundation complies with Charity Commission regulations and guidelines on governance, accounting and other aspects of good practice, such as public benefit, and such compliance has been supported over the years by attendance at Charity Update Seminars organised by the Foundation’s auditors and legal advisers. A full annual audit of the accounts is undertaken by auditors qualified and experienced in the scrutiny of charities. A comprehensive annual review is also produced. "We envision a system of education that awakens and develops innate human capacities under the light of Divine grace and guidance. In addition to the horizontal dimension of information and skills, we envision education where the vertical dimension is the primary axis of development, leading to a state of being characterized by spiritual awareness and human excellence." "Our mission is to design and apply a curriculum in accordance with the teachings of the Holy Qur'an intended to integrate our understanding of God, the universe, and our own human nature. This curriculum would provide unparalleled opportunities in breadth and depth for the total and balanced development of every student in every sphere of learning--spiritual, moral, imaginative, intellectual, emotional and physical--directing all these aspects towards the attainment of a conscious relationship with the Divine, the ultimate purpose of man's life on earth." I was first introduced to The Book Foundation and its educational projects at a meeting last May in Oxford with its Director, Dr. Jeremy Henzell-Thomas, and two other key collaborators for its curriculum development project (Dr. Kabir Helminski and Mrs. A. Gouverneur, founder of the famous 'Islamic Texts Society' of Cambridge) whom I have met occasionally at professional meetings and international conferences in Islamic, Religious and Middle East Studies over the past two decades. Book Foundation contributor, Jordan's Prince Ghazi Bin Muhammad, was nominated for 2009's Nobel Peace Prize. 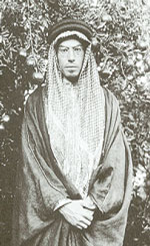 Prince Ghazi contributed to a major portion of The Book of Language. Kabir Helminski was named one of the 500 Most Infuential Muslims in the World by the Royal Islamic Strategic Studies Center in association with Georgetown University.